JOHN HAROLD WESTBROOK—A popular figure in the younger group of the industrial world of Troy, New York, John H. Westbrook is devoting his attention largely to the progress and welfare of the working man, and himself among the workers, his influence in this cause is counting strongly for advance. Mr. Westbrook is a native of this city, and a son of Robert M. and Cathrine (Flynn) Westbrook, both residents of this city, the father a sheet metal contractor. John H. Westbrook was born in Troy, New York, April 6, 1890. He first attended the Green School on Broadway, a private school, and later the Gale School on Seventh avenue, after which he attended Public School No. 5 until the age of sixteen years. He then entered the mills of this city as an apprentice at the sheet metal trade and after taking up this work he joined Local No. 15, of the Sheet Metal Workers' Union. Becoming a member on September 28, 1912, he was elected to the office of conductor, and also served as recording secretary, then, in 1917, was elected president of this local. In 1918 this body was consolidated with the corresponding body in the city of Albany and was carried forward under the title of the District Sheet Metal Workers' Union, Local No. 83. In 1920 Mr. Westbrook became business agent for this organization, in which capacity he still serves. He has for two years been president of the New York State Sheet Metal Workers' Union, and is ex-president of the Troy Building Trades Council. He has many times served as delegate to the Central Bodies conventions, and represents his local in the Labor Temple Association of Troy. In all his work along these lines Mr. Westbrook gives his best endeavors to the welfare of the group for which he is acting as champion, and much good has resulted from his efforts. In April, 1923, in partnership with G. A. Lewis, he purchased the sheet metal works of Edward Manogue Company, at Grand and Front streets, where they carry on a general contracting business in sheet metal work, roofing, skylights, ventilation, cornices, metallic ceilings, etc. Mr. Westbrook is also a leader in Democratic party politics in Troy, his interest in public aflfairs dating back to his boyhood. For several years before he became a voter he was an active and efficient worker for the Democratic party. 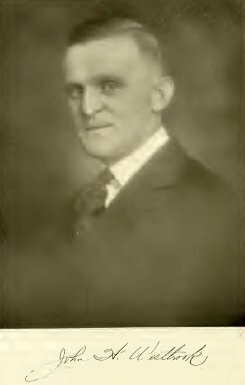 In 1917 he was elected a member of the Rensselaer County Board of Supervisors from the Second Ward of Troy to serve for a term of two years. Twice reelected in 1919 and 1921, he received increased majorities each time, and throughout his period of service has been active on the committees of military affairs and rules. At present he is serving as State Assemblyman. In 1923 he was the regular Democratic candidate for the office of member of Assembly, First Assembly District, of Rensselaer county. Widely connected fraternally, Mr. Westbrook is identified with the Loyal Order of Moose, the Troy Council, Knights of Columbus; the Catholic Council Welfare Society; the Society St. Vincent de Paul; and the Order of St. Francis. He is a member of St. Francis' Roman Catholic Church, and a member and now (1923) president of the Holy Name Society of that church. His recreative interests are outdoor sports, particularly baseball, and he is well remembered through his boyhood as an amateur "sand lot" baseball player of more than ordinary distinction. Mr. Westbrook married, on September 24, 1912, Florence Siegel, of Troy, daughter of John and Margaret (Mulrooney) Siegel, both deceased. Mr. and Mrs. Westbrook are the parents of two children: John Joseph, born March 18, 1916, now attending St. Francis' Academy, and Mary Florence, born January 11, 1920.